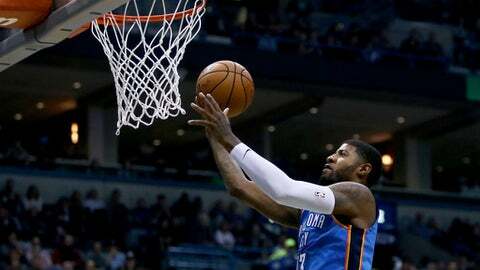 MILWAUKEE (AP) Russell Westbrook and the Oklahoma City Thunder were met with little resistance as they kept attacking the lane. George scored 20 points, hitting 4 of 8 from 3-point range. Westbrook had 12 points, 10 rebounds and nine assists, while Carmelo Anthony scored eight of his 17 points in the pivotal first quarter. Oklahoma City went from down four to a 20-8 lead on George’s jumper with 4:16 left in the first. It was essentially over from there, especially with the way Westbrook kept finding driving lanes. Adams finished with 14 points and 11 rebounds. Jerami Grant added 17 points off the bench for the Thunder. Milwaukee’s Giannis Antetokounmpo had 28 points on 9-of-14 shooting. But the NBA’s scoring leader spent much of the first quarter on the bench with two fouls, and the Bucks struggled from the 3-point line, opening 1 of 14. No other Buck scored in double figures. The star-laden Thunder taught a lesson to the up-and-coming Bucks, who hope to contend in the Eastern Conference. Oklahoma City prides itself on defense, with the Thunder came into the game averaging a league-high 11.5 steals. They were second in the league in forcing 19.7 turnovers a night. The Bucks coughed up the ball just 14 times but still came up well short. Khris Middleton (nine points, seven rebounds) struggled from the field, going 3 of 13 overall and missing all five 3-point attempts. Kidd said it will be up to Antetokounmpo’s teammates to not try to force the ball to the star forward. Bucks: The team had trouble getting anything going offensively with Antetokounmpo in foul trouble. Snell and Thon Maker hit back-to-back 3s late in the first half to end the 1-of-14 stretch. Milwaukee finished 9 of 30 for the night from behind the arc. … C Greg Monroe’s inside presence was missed. The veteran is out for at least another 12 days with a strained left calf. The 6-foot-11 Monroe helps open up the floor with his ability to score in the lane. Thunder: Host the Boston Celtics on Friday. Bucks: Visit the Charlotte Hornets on Wednesday.